Cannabis is a very thirsty plant. You can see below that marijuana plants need as much water as almonds. Where are we going? To the environmental impact of pot. I am not sure how to imagine 354 “weed cultivation facilities” but that is the total for Denver. Thinking at the margin, our focus is the extra electricity these producers require. Comparing 2012 to 2014, the energy needed by “grow facilities” increased from 86 million kwh to 200 million kwh. The Denver Post reports that almost half of Denver’s growth in electricity demand came from indoor pot growers. Indoors, marijuana growers enjoy more product control and better yield but they need a lot of heat and light. Totaling one-third of all production costs, energy is used primarily for high intensity lighting, maintaining temperatures, ventilation and humidity. 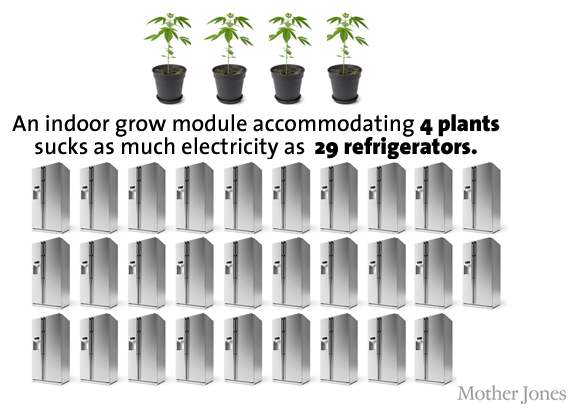 Comparable to what a modern data center needs, the electricity needed to raise five pounds of pot a year is the same as you use at home. Then we have other problems. Outdoor cultivation returns us to water. Add to that the deforestation and pesticide needs and you again get an environmental cost. When the relationships that growers have with their customers affect you and me, we have a negative externality. As a result, if we include the downside that third parties experience, the cost of growing marijuana is really more than its equilibrium price. On a graph, a negative externality is illustrated by a new hypothetical equilibrium that reflects the added cost. The supply curve shifts upward because production is more costly. Perhaps the legalization of recreational marijuana returns us to fractal mathematician Benoit Malendrot and the British seacoast. The closer you look, the more zigzags you see. These are eye-opening numbers. I agree yet skeptical on some points, maybe because some of the things mentioned here are way beyond my comprehension but I found the read very informative TBH.